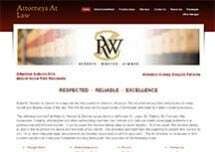 Whether your legal need is the result of an auto accident, a workplace accident, a recent arrest or a matter related to one of our other practice areas, look no further than the law firm of Roberts, Wooten & Zimmer for representation upon which you can depend. Our experienced attorneys will work together to ensure justice prevails for you. To discuss your situation with one of our lawyers, you can schedule a free initial consultation at our Hillsboro law office.